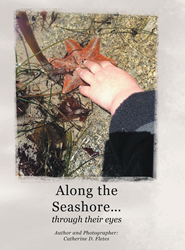 Author Catherine D. Fletes’s new book “Along the Seashore” is a book to delight children with magnificent discoveries at the water’s edge and within tide pools. Recent release “Along the Seashore” from Page Publishing author Catherine D. Fletes is a photographic stroll along the beautiful Monterey coast for readers of all ages. Catherine D. Fletes, a resident of California who loves to explore the Monterey coast through her children’s eyes, has completed her new book “Along the Seashore”: a charming book of photographs and educational descriptions of the myriad creatures living at the water’s edge. Published by New York City-based Page Publishing, Catherine D. Fletes’s photographic walk at the beach will delight young readers with an introduction to the marine life often found right at their feet. Gorgeous pictures of the creatures living by the water’s edge reveal the hidden and complex world flourishing in the tide pools left by receding waves. Readers who wish to experience this educational work can purchase“Along the Seashore” at bookstores everywhere, or online at the Apple iTunes store, Amazon, Kobo, Google Play or Barnes and Noble.